Jann is thrilled to showcase her entry into Main Street’s newest holiday tradition called “Get Your Tree On.” In collaboration with Karen Green from the Loft, the two of them have decorated their tree in the spirit of the season…that is to give back to those in need. 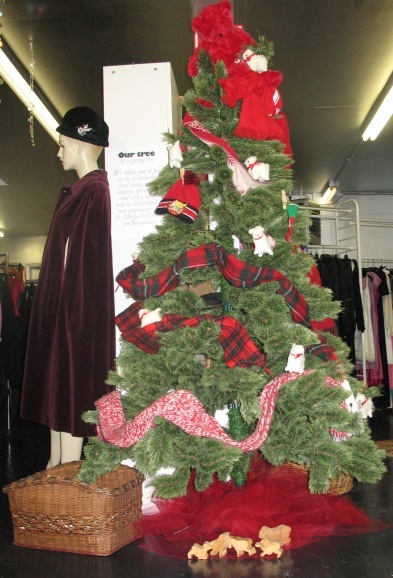 Everything on their tree will be donated to St. Michael’s Church, along with a box of food for the food bank. One of Vancouver’s most eclectic and vibrant shopping districts, Main Street, launched a new holiday tradition this week called “Get Your Tree On.” Forty merchants have joined forces to decorate Christmas trees and are inviting shoppers to vote on their favourite and enter into a draw for one of two amazing gift baskets. Each store has contributed either a gift certificate or product from their store towards the gift baskets, making each basket worth just over $1000…definitely making it worth while to head over to Main Street this week and to vote for your favourite tree (Bohemia’s of course).